In the Dugout is back! Every week, we will interview someone from the sports media, marketing and social media industry to find out a bit more about them, what they do and their sporting loves. Today’s guest is Gavin Wilson, Media Manager for Championship rugby league club York City Knights. 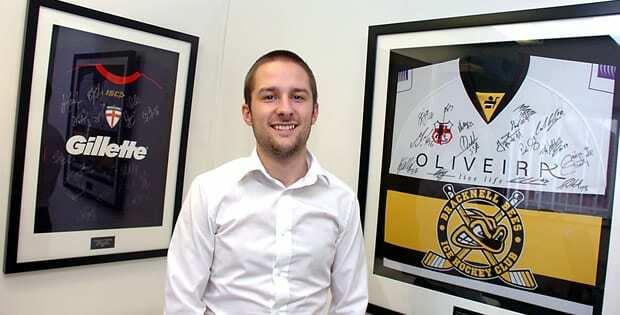 The Knights are renowned for having excellent social media output, so we spoke to Gavin about different types of content, quality over quantity and engaging with supporters. What was it that made you first get into rugby league? I was born into it really – my Uncle (Brendan Carlyle) used to play professionally for York, Hull FC, Scarborough and Doncaster and my Sundays were spent following him with my Grandad. Since you began working in this industry, how much more of an important tool has social media become? Absolutely huge – When I graduated in 2010 social media was just finding its feet as a mainstream media tool, and it’s been fascinating to see just how big it has become. It’s unheard of these days for a sports team to not have a social media presence. In a world where more clubs are trying to compete to get fans through the doors, what do you do to make York’s content stand out? York averaged attendances of 2,053 last year, up 26% from the 2017 campaign. The ethos around the whole club is built on values of Integrity, Partnerships, Vibrancy and Competitiveness, so I keep that in mind. I just try to have fun with it really, keep things positive and engage with the fans as much as possible. In terms of output, do you think that it is a matter of quality content over quantity or vice versa? It’s definitely a good combination of the two, create as much interesting/engaging content and share it as much as possible. If the content is boring or useless as a point of information then there’s no point in putting it out really – fans will rightly start to switch off. What has been the hardest thing you’ve had to deal with/cover as part of your role at the Knights? When I came on board as Media Manager in January 2017 the club had just been taken over by Jon Flatman, and I had to start from scratch with our Facebook and Instagram channels. It was challenging rebuilding the follower bases as quickly as possible but both channels are now doing really well. You produce a lot of excellent graphic-led and visual content on a regular basis. Do you think that this is the best way to get crowds engaged and interested in coming down to games? It certainly helps! Joe Smith (getemonside.co.uk) has come on board as a media assistant this year and his video content has been fantastic, especially on the newly launched YouTube channel ‘KnightsTV’. Graphic and visual content is also great for catching the eye in a fast moving social media world, as long as it’s short and snappy! With so many teams challenging for audiences/fans in your area, how hard is it to compete with the bigger sports eg. football, or is it a case of focusing on yourselves rather than external factors? We focus on ourselves first and foremost. We can’t control what other clubs do so its pointless worrying about them. York City Knights are in a great area in North Yorkshire – over 30 miles away from the next nearest professional rugby league club – and we are trying to position ourselves at the heart of the community in our wonderful city. We have a good relationship with the football club in York and there is definitely room for both of us in a city of York’s size. We’ve seen a lot of fan engagement with the Knights so far this season. Has that helped with building relationships with supporters and encouraging more of them through the turnstiles? Absolutely. We like to help the fans connect with the club and the players they’re supporting. It’s their club and they’re an important part of our success. We like to create a bit of an ‘event’ out of each home game, and the fans are at the heart of that. Under 16s get free entry to all Knights games too, its important to get them interested while they’re still young! There are some people who say that the media output at the Knights is better than some teams in the top flights. Given the budgets you have to operate on, how proud does that make you feel? Very proud! But it’s very much a whole club effort and everyone has a part to play in that success. Given the growth of York in recent years, both on and off the field, how far do you think they can go in the next four or five years?